ABUJA— A Federal High Court sitting in Abuja Monday, granted bail to four detained members of the Indigenous People of Biafra, IPOB, standing trial alongside their leader, Nnamdi Kanu, on treasonable felony charges. Trial Justice Binta Nyako while delivering ruling on the bail applications held that there was no objection filed by the Prosecution in respect to their applications. The court while granting them bail also put into consideration the period of time they have already spent in prison custody, and their deteriorating health conditions, since 2016 when they were arrested and arraigned to court. According to the judge, “I have heard all the affidavits in support of the applications, and I have not seen any response opposing them. “However, I have decided to look at the grant vis-á-vis the charge, and the term of imprisonment bordering on the same and also the time spent in custody. Each of the four defendants have been in custody for almost three years. “The second and third count charge which is levelled against the second and third defendants respectively carries a punishment of five years on conviction while the first count which affects all the four defendants carries a punishment of seven years on conviction. “I have also been kept abreast with the medical condition of the 3rd defendant. I have also read the judgement of my learned colleague, Ojukwu Ijeoma, under the provision of the Federal High Court Uyo; which granted bail to the 1st defendant. “I have also read Section 162 of the ACJA which validates the grant of bail to suspects in capital and non-capital offences. “Taking all these into consideration, I have not seen why, at this stage, I should not grant bail to the defendants. The court, however, listed a series of stringent conditions attached to their bail which it said the defendants must jealously abide in or risk the revocation of their bail. “The sum of 10 million naira should be deposited to the account of the chief registrar by each defendant with two sureties each with like sum and each of them must deposit their international travel documents (passports) to the court and must not travel out of the country without the permission of the court,” it stated. Other bail conditions includes that the defendants “should not be seen participating in rallies, gatherings, or granting press interviews. 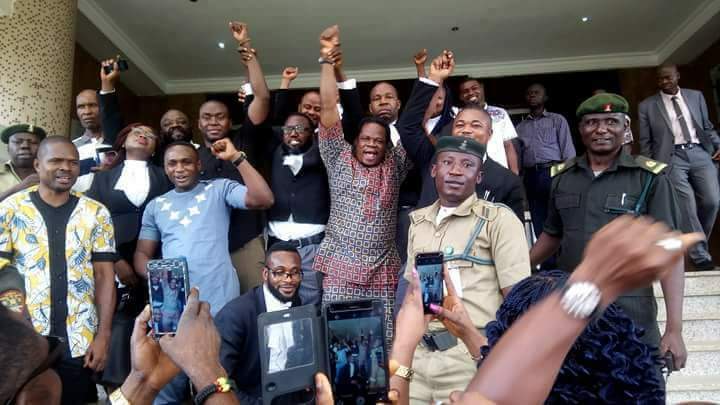 According to the judge, “no 'oyoyo' welcome gathering should be entertained pending when the trial is concluded, they must report every two weeks to their state commissioners of police. 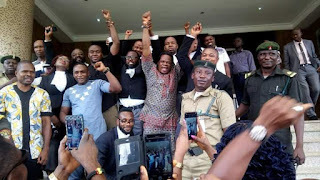 According to the ruling, the first defendant, Bright Chimezie is to report to the Rivers State commissioner of police, the second and fourth defendants, Chidiebere Onwudiwe and David Nwawuisi, respectively, should report to the Enugu State Police commissioner while the third defendant, Benjamin Madubugwu will report to the Anambra State commissioner of police. Stressing on the need to respect the bail conditions, the court further warned that violating or floating any of the conditions would warrant it to issue an order to the police for their re-arrest and detention to Kuje prisons of which they would not be granted bail till the end of the trial. The judge also obliged them time to perfect the financial terms of their bail bonds while the defendants go home but under some conditions which was not stated by the court. The court also ruled that the personal belongings of the defendants confiscated during their arrest will remain in custody till the end of the trial. It thereafter, adjourned the case, for continued trial, to November 14, 2018.